Bisoprolol-Astropharm 10 mg tablets # 20- instructions for use, pharmacological properties, indications and contraindications. auxiliary substances: lactose, monohydrate; sodium croscarmellose; microcrystalline cellulose; magnesium stearate. tablets of white color, flat-cylindrical shape with bevelled edges and risk on one side. Selective blockers of β-adrenergic receptors. ATX C07A code B07. Bisoprolol is a highly selective β1-blocker. When used in therapeutic doses, it does not show internal sympathomimetic activity and clinically expressed membrane-stabilizing properties. Has antianginal and hypotensive effect. Reduces myocardial oxygen demand by reducing heart rate and cardiac output and lowering blood pressure, increasing myocardial oxygen supply by reducing end-diastolic pressure and diastole lengthening. The drug has a very low affinity for the β2-receptors of the smooth muscles of the bronchi and vessels, as well as with the β2-receptors of the endocrine system. The maximum effect of bisoprolol occurs 3-4 hours after admission. The half-life of plasma is 10-12 hours, which provides a 24-hour effectiveness after a single dose. The maximum antihypertensive effect is achieved after 2 weeks of admission. Suction. 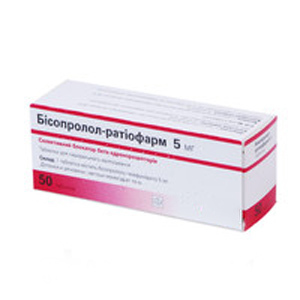 After oral administration, bisoprolol is well adsorbed from the digestive tract. Bioavailability is about 90% after oral administration and is not dependent on food intake. The pharmacokinetics of bisoprolol and the concentration in the blood plasma are linear in the dose range from 5 to 20 mg. The maximum concentration in the blood plasma is achieved in 2-3 hours. Distribution. The volume of distribution is 3.5 l / kg. Binding to plasma proteins is about 30%. Metabolism and excretion. 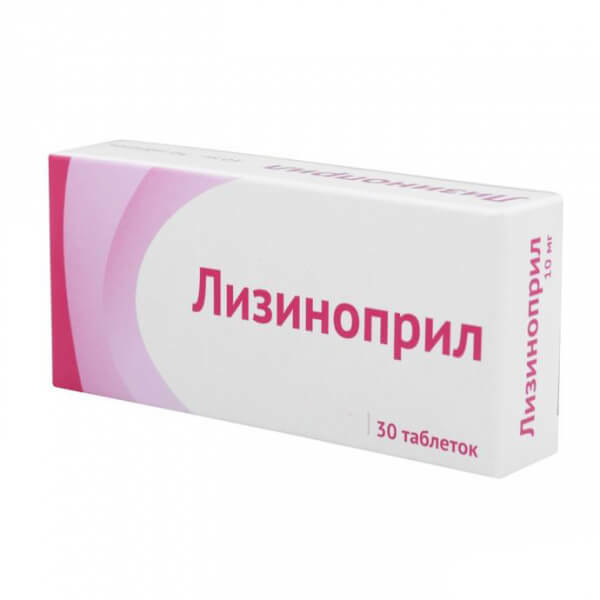 Bisoprolol is excreted from the body in two ways: 50% biotransformed in the liver with the formation of inactive metabolites and excreted by the kidneys, 50% excreted by the kidneys in unchanged form. In vitro studies using human liver microsomes showed that bisoprolol is metabolized with the participation of CYP3A4 (~ 95%), CYP2D6 plays only a minor role. The total clearance of bisoprolol is 15 l / h. The half-life is 10-12 hours. chronic heart failure with systolic dysfunction of the left ventricle in combination with ACE inhibitors, diuretics, if necessary - cardiac glycosides. hypersensitivity to bisoprolol or other components of the drug. Treatment of chronic heart failure. Class I antiarrhythmics (eg, quinidine, disopyramide, lidocaine, phenytoin, flecainide, propafenone) can potentiate the effect with respect to atrioventricular conduction and enhance the negative inotropic effect. Calcium antagonists (verapamil groups, to a lesser extent diltiazem) adversely affect myocardial contractility and atrioventricular conduction. Intravenous administration of verapamil in patients taking beta-blockers can lead to severe arterial hypotension and atrioventricular blockade. Hypotensive drugs with a central mechanism of action (clonidine, methyldopa, moxonidine, rilmenidine) can worsen the course of heart failure due to a decrease in the central sympathetic tone (decrease in heart rate and cardiac output, vasodilation). Sudden abolition of the drug, especially if it is preceded by the abolition of β-adrenoreceptor blockers, may increase the risk of ricochet hypertension. 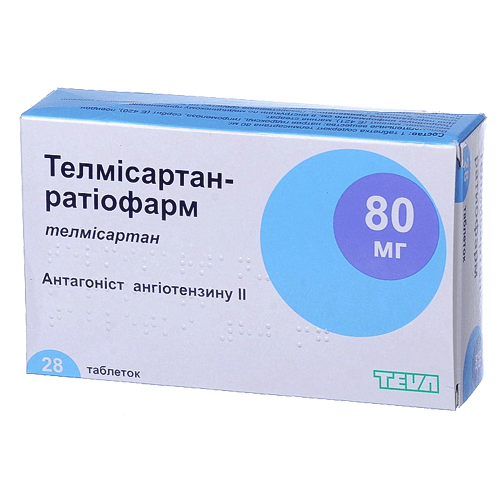 Treatment of arterial hypertension or coronary heart disease (angina pectoris). Antiarrhythmics of Class I (for example, quinidine, disopyramide, lidocaine, phenytoin, flecainide, propafenone): Potentiation of the effect with respect to atrioventricular conduction and enhancement of the negative inotropic effect is possible. Calcium antagonists of the dihydropyridine type (for example, nifedipine, felodipine, amlodipine) may increase the risk of arterial hypotension. The possibility of increasing the negative effect on the inotropic function of the myocardium in patients with heart failure is not ruled out. Antiarrhythmic drugs of the third class (for example, amiodarone): Potentiation of influence on atrioventricular conduction is possible. Local β-blockers (eg, contained in eye drops for the treatment of glaucoma) can exacerbate the systemic effects of bisoprolol. Parasympatomimetics can increase the time of atrioventricular conduction and increase the risk of bradycardia. Insulin and oral hypoglycemic agents increase hypoglycemic action. Blockade of β-adrenoceptors can mask symptoms of hypoglycemia. Means for anesthesia increase the risk of oppression of myocardial function and the occurrence of arterial hypotension (see section "Features of application"). Cardiac glycosides: reduce the heart rate, increase the time of atrioventricular conduction. Nonsteroidal anti-inflammatory drugs: possible weakening of the hypotensive effect of bisoprolol. β-sympathomimetics (eg, orciprenaline, isoprenaline, dobutamine): use in combination with bisoprolol may lead to a decrease in the therapeutic effect of both agents. To treat allergic reactions, you may need higher doses of epinephrine. Sympathomimetics, activating α- and β-adrenergic receptors (for example, adrenaline, noradrenaline): a vasoconstrictive effect mediated through α-adrenoreceptors is possible, which leads to an increase in arterial pressure and increased intermittent claudication. Such interaction is most likely when using non-selective β-blockers. When combined with antihypertensive agents and agents that exhibit an antihypertensive effect (eg, tricyclic antidepressants, barbiturates, phenothiazine), an increased risk of hypotension may occur. Mefloquine: there may be an increased risk of bradycardia. MAO inhibitors (except for MAO type B inhibitors) increase the antihypertensive effect of β-blockers, but there is a risk of developing a hypertensive crisis. Treatment of stable chronic heart failure with bisoprolol should begin with the titration phase. Patients with ischemic heart disease should not be discontinued suddenly without emergency, as this can lead to transient deterioration. Initiation and discontinuation of bisoprolol treatment requires regular monitoring. To date, there is insufficient therapeutic experience in the treatment of heart failure in patients with the following diseases and pathological conditions: type I diabetes mellitus (insulin-dependent), severe renal or hepatic impairment, restrictive cardiomyopathy, congenital heart disease, hemodynamically significant valvular heart disease acquired, myocardial infarction in the last 3 months. In patients who are scheduled for general anesthesia, the use of β-blockers reduces the incidence of arrhythmia and myocardial ischemia during the introduction of anesthesia, intubation and postoperative period. 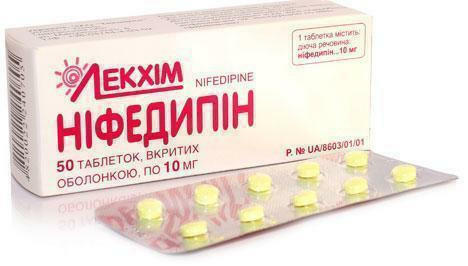 It is recommended to continue the use of β-blockers during the perioperative period. It is necessary to warn an anesthesiologist about admission of β-adrenergic blockers, since the doctor must take into account the potential interaction with other drugs that can lead to bradyarrhythmia, reflex tachycardia and a decrease in the capacity of the reflex mechanism to compensate for blood loss. In case of cancellation of bisoprolol before surgery, the dose should be gradually reduced and discontinued 48 hours before general anesthesia. Combinations of bisoprolol with calcium antagonists of the verapamil or diltiazem group, with class I antiarrhythmic drugs and with central-action antihypertensives are not recommended (see "Interaction with Other Drugs and Other Interactions"). Although cardioselective β-blockers (β1) have less effect on lung function than non-selective β-blockers, they should be avoided, like all β-blockers, in obstructive airway diseases, if there is no reason to conduct therapy. If necessary, the drug Bisoprolol-Astropharm should be used with caution. In patients with obstructive airway disease, bisoprolol treatment should be started at the lowest possible dose, and patients should be monitored for new symptoms (such as dyspnoea, intolerance to physical activity, cough). In bronchial asthma or other chronic obstructive pulmonary diseases that can cause symptoms, concomitant therapy with bronchodilators is indicated. In some cases, when taking the drug, patients with bronchial asthma may require higher doses of β2-sympathomimetics because of increased airway resistance. Patients with psoriasis (including in the anamnesis) β-blockers (for example, bisoprolol) are prescribed after a careful correlation of benefit / risk. Patients with pheochromocytoma are prescribed Bisoprolol-Astropharm only after therapy with α-blockers. Symptoms of thyrotoxicosis can be hidden on the background of taking the drug. With the use of the drug, a positive result can be noted during doping control. Pregnancy. Bisoprolol has pharmacological properties that can cause harmful effects during pregnancy and / or fetus / newborn development. As a rule, β-adrenoblockers reduce placental blood flow, which can cause a delay in intrauterine development, intrauterine death, involuntary abortion or premature birth. Side effects can occur in the fetus and the newborn (eg, hypoglycemia, bradycardia). If treatment with β-blockers is necessary, it is desirable that it is a β1-selective adrenoblocker. During pregnancy, the drug is used only when the expected benefit to the mother exceeds the potential risk to the fetus.It is necessary to monitor uteroplacental blood flow and increase the fetus. In case of adverse effects on pregnancy or fetus, alternative treatment should be considered. After delivery, the newborn should be carefully monitored. Symptoms of hypoglycemia and bradycardia can be expected throughout the first 3 days. The period of breastfeeding. There is no data on the excretion of bisoprolol into breast milk, so it is not recommended to use the drug during breastfeeding. In studies involving patients with ischemic heart disease, the drug did not affect the ability to drive vehicles or other mechanisms. However, in individual cases, the drug may affect the ability to drive vehicles or work with complex mechanisms. Particular attention should be given at the beginning of treatment, with a change in the dose of the drug or in the interaction with alcohol. Bisoprolol-Astropharm should be taken without chewing, in the morning, on an empty stomach or during breakfast, with a small amount of liquid. Arterial hypertension; ischemic heart disease (angina). The recommended dose is 5 mg (1 tablet of 5 mg) per day. In the case of moderate arterial hypertension (diastolic pressure up to 105 mm Hg), a dose of 2.5 mg is acceptable. If necessary, the daily dose can be increased to 10 mg (1 tablet of 10 mg) per day. The maximum recommended dose is 20 mg per day. The dose adjustment is performed by the doctor individually, depending on the patient's condition. Bisoprolol-Astropharm must be used with caution in patients with arterial hypertension or coronary heart disease accompanied by heart failure. Chronic heart failure with systolic dysfunction of the left ventricle, in combination with ACE inhibitors, diuretics, if necessary - cardiac glycosides. Standard therapy for chronic heart failure: ACE inhibitors (or angiotensin receptor blockers in case of intolerance to ACE inhibitors), β-adrenoreceptor blockers, diuretics and, if necessary, cardiac glycosides. Bisoprolol-Astropharm is prescribed for the treatment of patients with chronic heart failure without signs of exacerbation. Therapy should be conducted by a doctor with experience in the treatment of chronic heart failure. Treatment of chronic heart failure with bisoprolol begins in accordance with the following scheme of titration and can be adjusted depending on the individual reactions of the body. 10 mg of bisoprolol fumarate once a day, as maintenance therapy. * Use in appropriate dosing. At the beginning of therapy for chronic heart failure, bisoprolol in tablets of 2.5 mg is recommended. The maximum recommended dose of bisoprolol fumarate is 10 mg 1 time per day. At the beginning of treatment of persistent chronic insufficiency, regular monitoring is necessary. During the titration phase, control over vital signs (blood pressure, heart rate) and symptoms of progression of heart failure is necessary.Symptoms can develop from the first day after the start of treatment. If arterial hypotension or bradycardia worsens during the titration phase or after it, cardiac impairment worsens, a dose adjustment is recommended, which may require a temporary reduction in the dose of bisoprolol or, possibly, discontinuation of treatment. After stabilization of the patient's condition, the treatment is continued. The course of treatment with Bisoprolol-Astropharm is long. Do not stop treatment suddenly and change the recommended dose without consulting a doctor, as this can lead to a worsening of the patient's condition. If necessary, treatment with the drug should be completed slowly, gradually reducing the dose (for example, reducing the dose by half every week). Patients with hepatic and renal insufficiency. Arterial hypertension; cardiac ischemia. For patients with a malfunction of the liver or kidneys of mild and moderate degree, the dose selection is usually not necessary. For patients with severe renal failure (creatinine clearance <20 mL / min) and patients with severe liver failure dose should not exceed 10 mg daily dose bisoprolol. Limited data are available for the application of bisoprolol patients who are on dialysis. Chronic heart nedostatochnostNet data on the pharmacokinetics of bisoprolol in patients with chronic heart failure simultaneously with impaired liver function and / or renal, however increasing the dose must be carefully. Clinical data on the efficacy and safety of bisoprolol for treatment of absent children, so you should not use the drug in this category of patients. The most frequent symptoms of an overdose of bisoprolol are bradycardia, hypotension, congestive heart failure, hypoglycemia, and bronchoconstriction. There is wide variation in individual sensitivity to a single high dose of bisoprolol in heart failure patients may be more sensitive to the drug. In case of overdose, you should immediately consult a doctor. Depending on the extent of drug overdose treatment is stopped and a supportive and symptomatic therapy. There is limited evidence that bisoprolol difficult amenable to dialysis. When bradycardia: intravenous atropine. If no response, isoprenaline administered with caution or other preparation with a positive chronotropic effect. In exceptional cases, introduce an artificial pacemaker. If hypotension: application of vasoconstrictors, intravenous administration of glucagon. In atrioventricular block II and III degree: administering an infusion of isoprenaline; if necessary - pacing. During exacerbation of chronic heart failure: intravenous administration of diuretics and vasodilators. When bronchospasm: bronchodilators (e.g. isoprenaline), β2-adrenoceptor agonists and / or aminophylline. With the cardiovascular system: bradycardia (in patients with chronic heart failure), signs of worsening of heart failure (in patients with chronic heart failure), impaired atrioventricular conduction, bradycardia (in patients with hypertension or ischemic heart disease), signs of worsening of heart failure (in patients with hypertension or ischemic heart disease), a sensation of cold or numbness in the extremities, hypotension (especially of patients with heart failure). From the nervous system: dizziness, headache (. Applies only to patients with hypertension or ischemic heart disease These symptoms usually occur early in treatment, are mild and disappear within the first 1-2 weeks), syncope. From the side of view: reduction slezovydeleniya (to consider when wearing contact lenses), conjunctivitis. On the part of hearing: hearing impairment. The respiratory system: bronchospasm in patients with asthma and a history of chronic obstructive airways disease, allergic rhinitis. On the part of the digestive tract: nausea, vomiting, diarrhea, constipation. On the part of the skin and connective tissue: hypersensitivity reactions, including pruritus, redness, rash; alopecia. In the treatment of β-blockers may be observed degradation of psoriasis patients as psoriatic rash. On the part of the musculoskeletal system: muscle weakness, cramps. Reproductive system: violation of potency. Psychiatric disorders: depression, sleep disturbances, nightmares, hallucinations. Laboratory indicators: increase in blood triglycerides, elevated liver enzymes in serum (AST, ALT). General disorders: asthenia (patients with congestive heart failure), fatigue (. Applies only to patients with hypertension or ischemic heart disease These symptoms usually occur early in treatment, are mild and disappear within the first 1-2 weeks), asthenia (in patients with hypertension or ischemic heart disease). In case of any side effects or adverse reactions should inform your doctor immediately. Stored in original package at a temperature not higher than 25 ° C. Keep out of the reach of children. 10 tablets in a blister; 2 or 3 blisters per box.